The Union environment ministry is all set to approve the Navi Mumbai international airport. The ministry’s Expert Appraisal Committee (EAC) recommended clearance to the airport on November 10 subject to conditions. 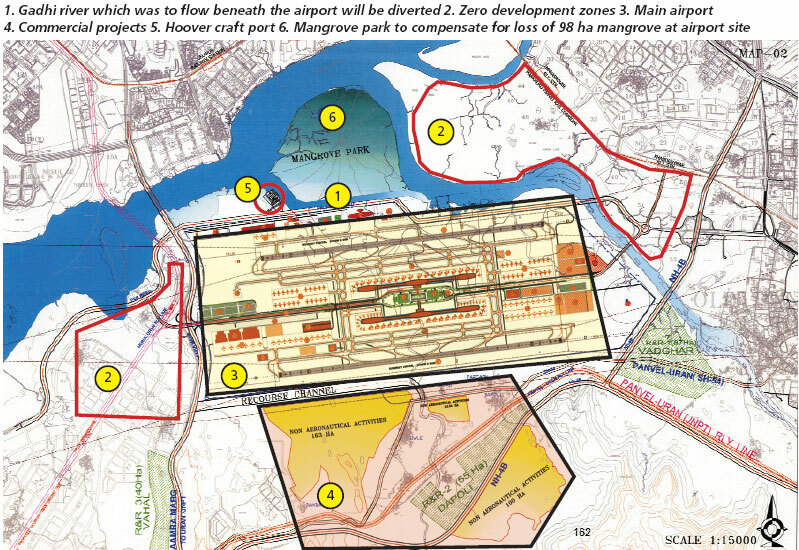 It cleared only the aeronautical area (see map) spread over 1,160 hectares (ha) and identified a number of land parcels north and west of the airport as no development zones to protect mangroves. Related development projects on 276 ha—golf course, hotels and commercial establishments—were not cleared. “We have not considered the excuse that the other projects would make the airport commercially viable while clearing the project,” a committee member said. These projects were earlier proposed in coastal regulation zone (CRZ) near the airport; eac recommended they be shifted south of the airport near existing sez land. eac clarified the commercial projects could obtain individual clearances later. Activists are not happy with this. Debi Goenka of the non-profit Conservation Action Trust said treating the project piecemeal would make it easy for the commercial projects to obtain clearances later. “We know the airport is not viable without the commercial projects,” said Goenka. The clearance ends months of speculation; the environment ministry and the civil aviation ministry have been at loggerheads over the project which was approved by the Union Cabinet in 2007. The row centred on the location of project site in Kopra-Panvel area which has mangrove forest on 415 ha and on displacement of 2,000 people. eac had asked the project developer, City and Industrial Development Corporation (CIDCO), to revise its plans after it refused to change the airport site. The revised plan, now approved by eac, has reduced the width of the runway from 1,854 metres to 1,550 metres; this would mean the Gadhi river, which was to flow under the airport, would now be diverted. “Raising the land level (to allow the river to flow beneath)would have made landing difficult and posed a security threat, so we asked CIDCO to divert the river by narrowing the distance between the strips,” the eac member said. The developer has been asked to develop a mangrove park on 210 ha to compensate for loss of 98 ha of mangrove on airport land. A proposed hoover craft port near Ulwe creek in the mangrove park has been scrapped. The eac has recommended another committee with the Bombay Natural History Society as a member to keep tabs on the ecological effects of the proposed airport. Goenka said the destruction of mangroves amounts to contempt of court as a Bombay High Court order prohibits diversion of mangroves for alternative uses. eac is likely to submit its recommendations to the ministry for final approval early December.